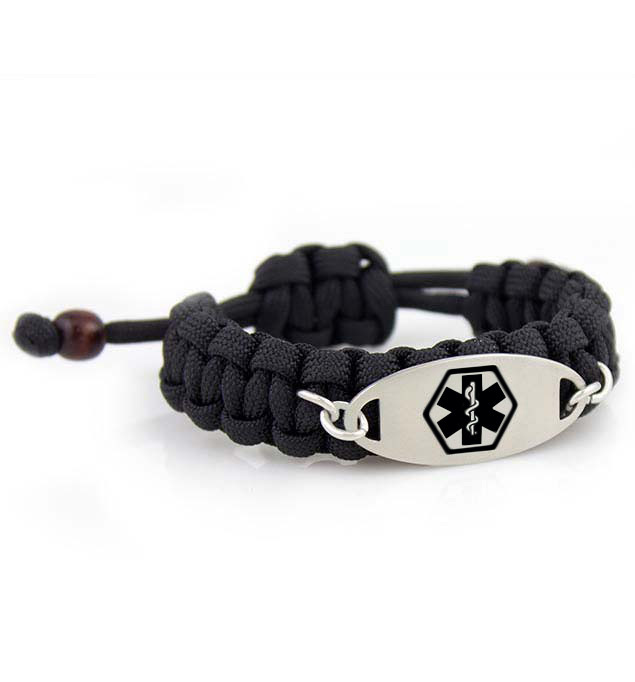 Trooper is a durable, water-resistant medical ID bracelet featuring hand-woven, black paracord material. This adjustable medical alert bracelet features an affixed, custom-engravable Black Oval medical ID tag. On-trend and casual, our paracord medical ID bracelets feature an adjustable slipknot closure, making them easy to put on, remove, and adjust for comfort. Adjustable paracord medical ID bracelets are ideal for people with metal allergies, as the affixed tag and its hardware do not lay against the skin during wear. With their convenient slip-knot closures, paracord medical IDs are also a great option for people who find traditional clasps challenging, such as those with arthritis or Parkinson’s. Slip-knot and other adjustable medical ID bracelets are also convenient for people undergoing weight loss, such as those who have undergone gastric bypass or gastric sleeve surgery, and those who may experience swelling of the extremities, as may be the case with lymphedema. A little adjustability goes a long way in ensuring that you have a properly fitted, comfortable medical ID to wear every day. Every medical ID works for you with custom engraving! Whatever your needs may be, our custom-engravable medical ID bracelets are a perfect fit. Once you select your style and size, simply list out your engraving, and we will personalize your medical ID just for you. To measure for your Lauren’s Hope medical ID bracelet, take a snug measurement of your wrist starting at the 0, leaving no room between your skin and the measuring tape. Size Small fits wrists between 5.5" - 7". Size Large fits wrists between 7" - 8.5".